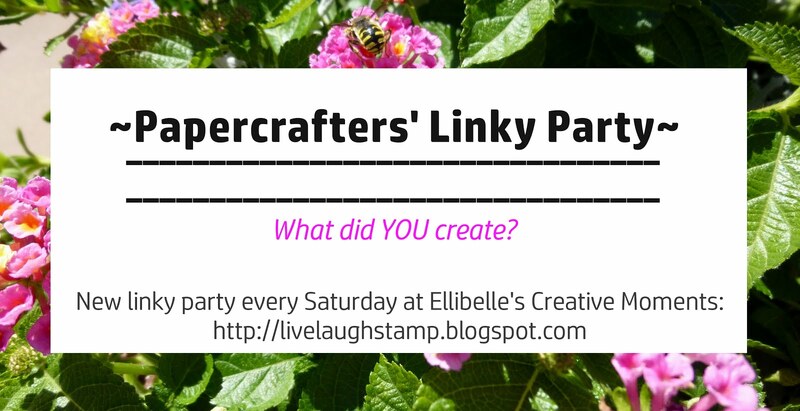 Whimsy Inspirations Blog to take a peek. 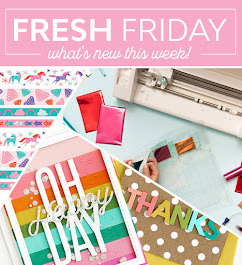 Of course we are holding another blog hop with some fabulous inspiration from the Design Team. And as always one lucky "hopper" will win two gorgeous new release stamps. All you have to do to be entered, is visit each DT member (listed below), and leave comments along the way. Since today is also the day for the Rubber DT to share a creation for this month's Whimsy Challenge, I decided to combine my card with the challenge creation. The theme this month is "Masculine Cards". There is still time to play along in the Whimsy Challenge, for some fabulous prizes. 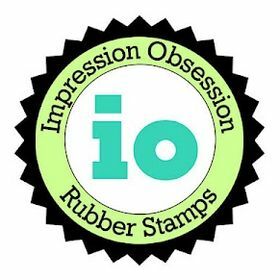 You may use any make of stamps, it is not a requirement to use a Whimsy Stamp. Here is my creation, using stamp sets from Whimsy's Raindrop Echo Designs. 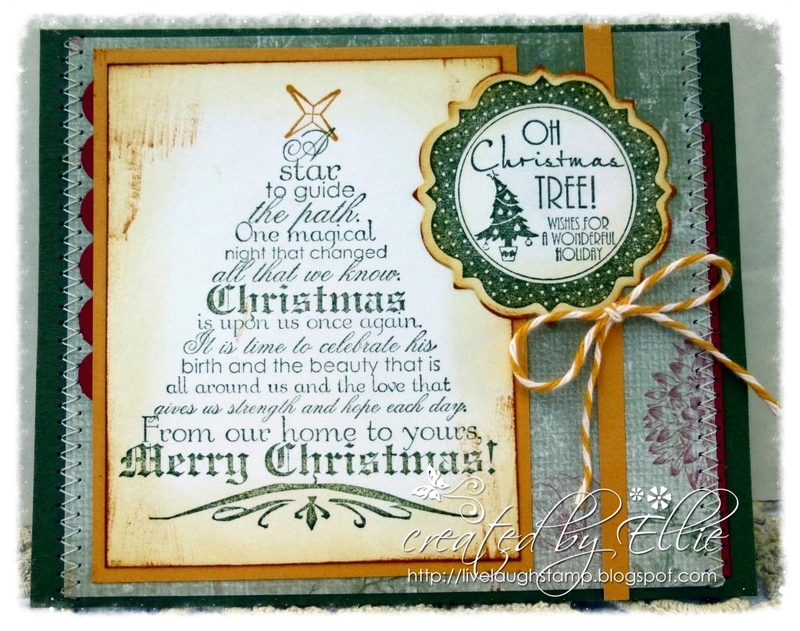 I used the Season's Greetings Notables 7 set again from today's release, and I also used an older sentiment set, also from Whimsy Stamps, Christmas Tree in Words. It is several years old, but new to me, so I thought why not show it off too. The background paper is from Michele Roos Design, it's not a christmas paper, but I thought it worked well with my color scheme. It is part of the pack "In the Garden". I inked up all edges using the Direct to Paper technique. I really didn't want to add any stitching because it might not be counting as "masculine" but I just felt like something was missing so I did it anyway. I know the men in my life won't mind. The twine, which I just received from Whimsy Stamps as well (Lemondrop yellow) was a perfect match for the mustard-y paper that I used, so I added a bow too. If you'd like to hop along with us today, simply visit the blogs listed, and don't forget to leave comments for a chance to win. As always the prize location is kept secret. My daughter had some fun with the September Release stamps too. 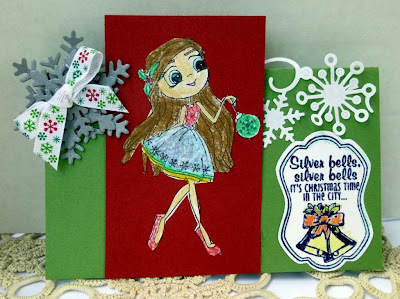 She saw the cute Snowflake Bauble stamp from Whimsy's Time for Tea designs on my craft desk, and was she really wanted to make a card with it. Here is what she came up with. She is only 7, and did all the fussy cutting all by herself. Didn't she do an amazing job!! 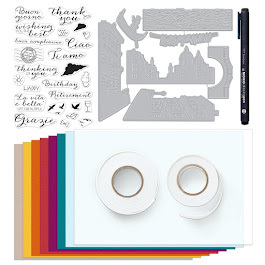 Of course she colored the image herself too, and found some diecuts and the sentiment that I had in im "extras" jar on my desk, to decorate the card with. The silver snowflake was made using whimsy's layered snowflake dies, and the white snowflakes were made with the snowflake border die. The sentiment was already stamped and cut out too (last year but I didn't end up using it then), she did decide to color the bells on it. It's from the set Holiday Carols Notables 4. It was cut out with the Notabes 4 die. Thanks so much for visiting today! Have fun hopping and don't forget you still have time to play in whimsy's current challenge - masculine cards - for more chances to win! Such an elegant card. Love this stamp!! Your daughter's card is super cute too! 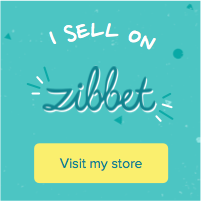 Such sweet work - loved checking out your blog. A stunning masculine Christmas creation and the twine is a nice touch. Love your daughter's pretty creation. Your card is gorgeous Ellie, such a wonderful image and the colours and details are so beautiful. WOW! Your daughter's card is fantastic. She has coloured the sweet image so beautifully and the design is brilliant. She obviously has a good teacher! Both cards are oh so beautiful!! Oh wow! The tree is so sophisticated and pretty...I really like this one! Great card Ellie,love that tree and your daughters card is so cute!! Ellie; I love your card! That tree stamp is amazing and your background paper is perfect as well as is the stitching, great job! Gorgeous card, Ellie! It's very elegant! Your daughter's card is so cute, too! Wow...love this stamped tree. The message is wonderful. Love your card!!! 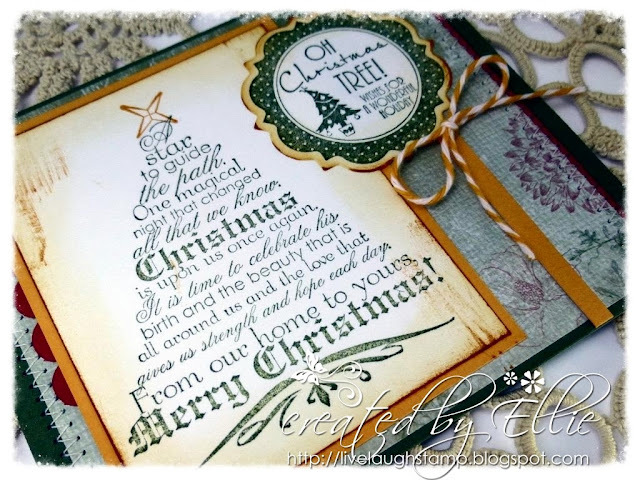 Wonderful tree stamp & beautiful card! Love that your daughter got into the act too! Love that Christmas tree image...and you left out all the fru-fru trimmings to make it a truly masculine card! What a beautiful card - love the tree made of words and how you have made it pop out. You can see where your daughter gets her talent from - really great card. It's a great Christmas card for a guy Ellie and your daughter did a wonderful job with her card too. Such a beautiful, inspiring Christmas Card, and your daughter's card is so cute too! Beautiful Ellie!! Love the new dp's by Michelle :) Your daughter's card is Fantastic! !